Hello everyone! Fall is my favorite time of year, and every year, I can't wait to make a new coat. There are really only so many styles of winter coats available in the stores to choose from, so making your own gives you the opportunity to find that special style or color that really fits you. Last February, I made some mauve colored dresses, and I realized that I had no coats that looked nice over them. So, I was on the hunt for something in the purple/brown colorway, and as usual, FabricMart had the perfect fabric- a wool tweed that was a mix of plum and black with some orange flecks. If you think that you are seeing some purple in my hair, don't adjust your monitor- I have dyed my hair lavender! So, this fabric also complements my new hair color. I wanted a style that is easy to close. I hate messing around with buttons and zippers, but I also don't like a constricting belt around my tummy. I found McCalls 7485, which is a Khaliah Ali design that had an interesting closure in View C- two ties that are threaded through a buckle just under the bustline. I also really liked the uneven hemline. 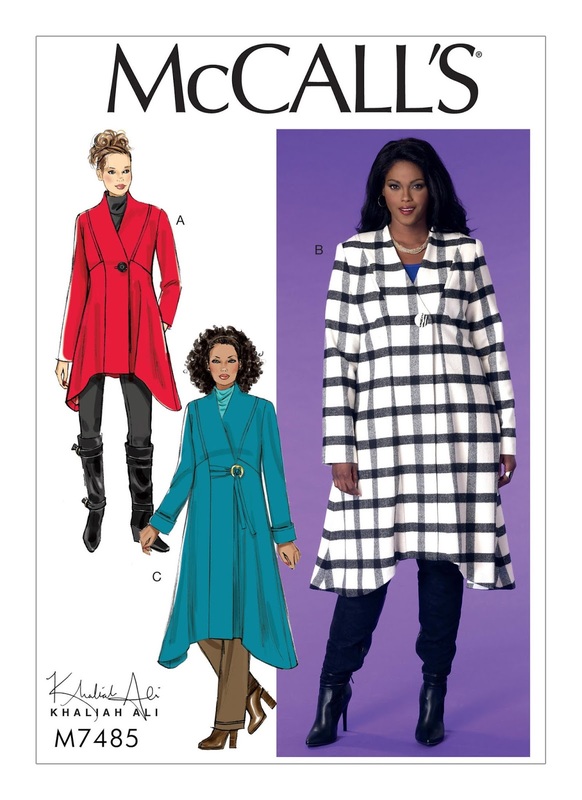 This poor pattern has been really underlooked- I couldn't find even one other review of it online, and even on the McCall's website, it's not listed in the coat category! But then I found out that it didn't come in my regular size- only in the women's size range 18-24. I don't know why they didn't print this in all sizes, but I always have to spend time doing alterations, and this just involved doing some different alterations. Instead of a full bust adjustment, I did a small neck and shoulder adjustment. Even with the larger size, I still found the bicep measurement to be extremely small, and needed to do a full bicep adjustment. And I added length all around since I"m taller than average. Here you can see the back hemline mirrors the front. It lets my dress just peak out from the bottom. I had found this beautiful Liberty of London Wool gauze scarf at an estate sale, and it goes perfectly with it. I have always heard of the outstanding quality of Liberty of London, and will absolutely confirm that. If it didn't have the fabric composition tag, you wouldn't even know that this is wool- it is so light and silky. Speaking of silky, let me tell you about the lining. It is a stretch satin in a pale mauve shade. The sun is kind of washing it out in the photo, but it's a nice complement to the tweed. I wasn't really sure how to attach the buckle, as that wasn't covered in the instructions. It specified a 2" buckle, and I found one that was made of coconut shell at Hobby Lobby. I used a piece of black fold over elastic and sewed it into the seam where the front facing meets the body of the coat. 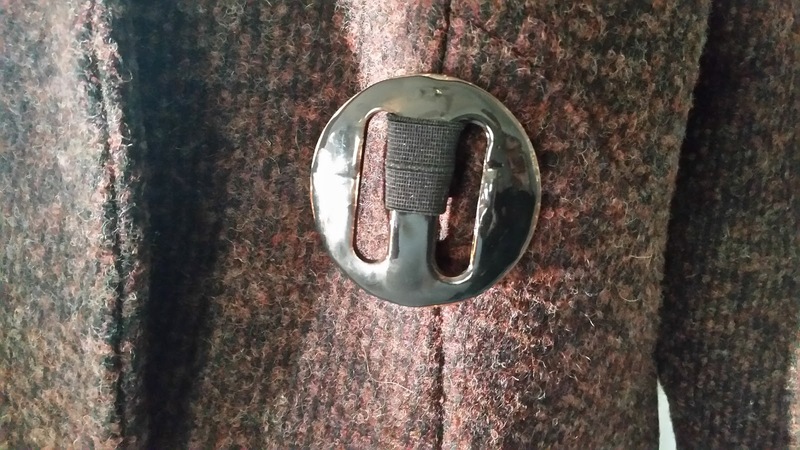 It worked well, and gives the buckle a little space to move if needed. I've actually got many dresses that this coat will work with- burgundy, black, orange and pink are all possibilities. If you are in the market for a new coat, consider making one.It's a big project, but packs a punch in terms of being able to wear it everyday! FabricMart has some awesome coating selections right now here. I've already picked out my next coat fabric and will be back next year to share it with you! It looks great on you. I love your attention to detail that elevates it to couture level. Did you interline it with something for extra warmth? Thank you, Karen! No, I thought about interlining, but this was a pretty tightly woven wool, and I decided that it by itself would be warm enough. Lovely coat. Your hair color is great too! Ann, this is a beautiful coat! You look awesome in it! Absolutely stunning... I love sewing fall and winter clothes too! Thank you, Patricia! Especially sewing with wool- there is just something relaxing about steaming wool! Great job and look on you.